The signal type is only a matter of representation. Functionally it won't make any difference to the logic. Used for distant signals. If the SVG theme supports it the respective symbol is shown in the track plan. The signal is linked with the block it belongs to by adding it as Distant Signal. Used for main signals. If the SVG theme supports it the respective symbol is shown in the track plan. The signal is linked with the block it belongs to by adding it as Signal. Used for shunting signals and similar types. If the SVG theme supports it the respective symbol is shown in the track plan. 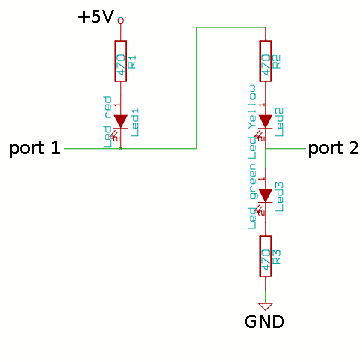 The signal is linked with the block it belongs to by adding it as Signal or Distant Signal. 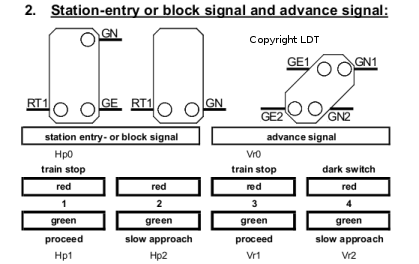 Shunting signals only support 2 aspects. This type of signal is not a railway signal but a Rocrail icon in the track plan representing the locomotive's state in automatic and half automatic modes. This type does not require further settings like addresses, aspects etc. The signal is linked with the respective block in the block properties as State Signal. Specifies the number of aspects the signal can show. A number of aspects above 4 is considered/handled as "Multi Aspect Signals"
Default with all four addresses where RED is LSB and WHITE is MSB. Multi aspect signals can only be set by action, route command or manually. Multi aspect signal SVG symbols are not part of the Rocrail setup. Some dummy symbols are found in the Accessory Theme. Optional symbol name prefix for use with multi aspect signals. 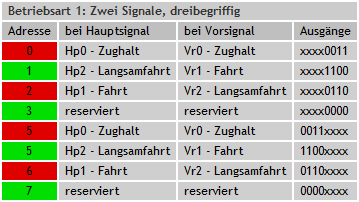 Multi aspect signal is defined as: Nr. Aspects > 4. This needs the Aspect numbers Control type. This only has affect when using SVG symbols and will show a small low placed signal. Use the prefix for signals with less then 5 aspects. Patterns are useful for semaphore/signal decoders. The radio buttons represent the gates to set high for a certain signal pattern. 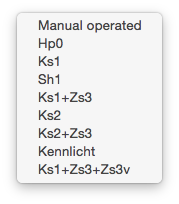 The user manual of the decoder should provide information on how to setup this table. No command is send if radio button N is selected. 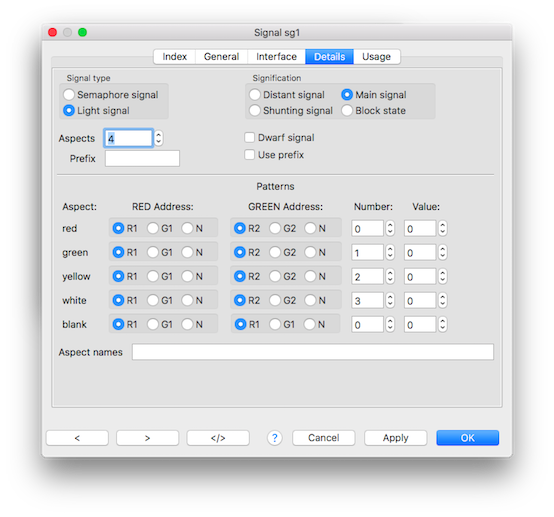 See Signal Setup, chapter 3.2 for details and configuration examples. The number for the Aspect number and the Linear Control Type. The value used by the Command Station to represent an aspect number into a bit pattern. A value of (1+2+4+8) 15 will turn All bulbs/LEDs on. A value of (2+4) 6 will turn bulbs/LEDs Green and Yellow on. This is a comma separated list. Note: The LDT signal decoder has to be set up with patterns. The assignments in the following table were tested with several command stations, however, in some cases it may be necessary to exchange G1/R1 and R2/G2, respectively meaning red is R1-N, green is G1-N etc.